This was such a fun quilt to make. I had a few quiet hours to sew and there’s nothing like a simple quilt for some (semi) instant gratification. It used up some of the small strips hidden in my fabric piles I couldn’t bear to throw into the scrap bin just yet. So lucky that you're only an hour from yellowstone! Have fun! 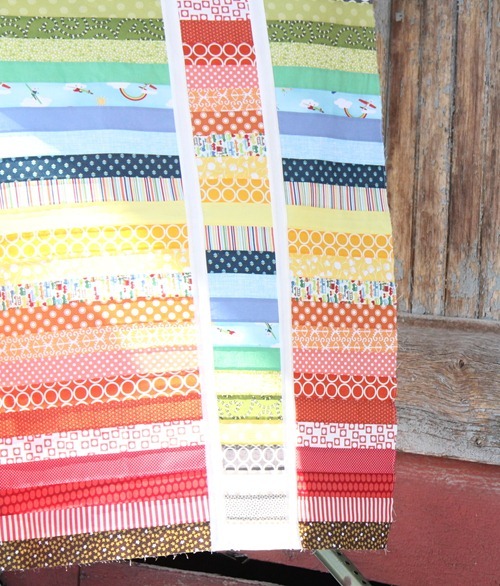 Such a fun rainbow quilt to return to when you're back. I love rainbow quilts. This one is lovely! oh my gosh! this is amazing!!! What a pretty quilt you made so fast. I have to tell you that your patterns are awesome! I just ordered some and was blown away by the paper and color. I wish everyone would print theirs that way. This is a stunner! Can't wait for the tut! You're an hour from Yellowstone, I'm in B.C. and we're an hour from Vancouver on the coast… I love that our continent is so diverse! Have a wonderful time! A riot of color and tutorial too? Have a great time at Yellowstone ~ how wonderful to live so close to a natural wonder! Oh I really love it. It's simple and really just AWESOME! How cute! We thought of you guys while we were fishing at the Nature Park last night (because Jay told David all about your fishing adventures!) Now I want to go eat ice cream in West Yellowstone! Have you had a huckleberry shake from Frosty's in Ashton? So. Dreamy. this is gorgeous! love it! oh, wow!!! this is just so beautiful. it makes me want to go cut fabric immediately! love this. beautiful, simple, would really fill that need to get something fun done fast so I can get my mind back on that project that seems to be taking forever. Beautiful quilt! It was worth all the spare time you spent with it! Popping over from craftytammie…love the great patterns you provided for her giveaway…..i hope i win…fingers crossed. Beautiful colors! Isn't it great when we can sew a top start to finish? Yes, swirls or loops will soften the lines… Enjoy your trip! So simple and so effective – which is usually the way. I find simple and quick is the method I use for all my crafts these days. Finding I finish things and enjoy doing them more. Beautiful! So simple, but so striking! Love it. Beautiful. I love all the color. What a cute quilt. Love It! Great way to use up some fabric. yabba-dabba-doo! so jealous that you're that close to yellowstone . . . I love this quilt. Definitely pinned it to my "quilt inspiration" board on pinterest! 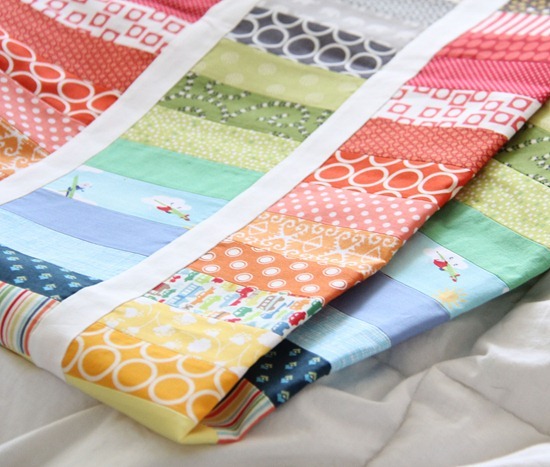 What a cheery little baby quilt and what a great way to use up bright scraps. Where's the great ice cream? We;ll be in Yellowstone in August! 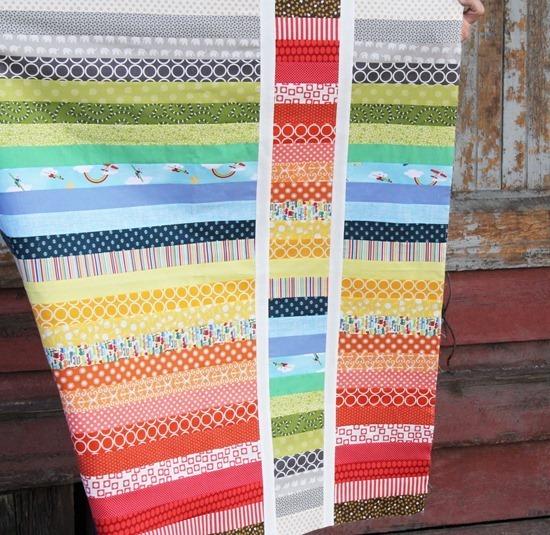 This is such a cute quilt and definitely a great use of all of those strip scraps we all have!!! I am definitely looking forward to your tutorial! Enjoy Yellowston! Very pretty in it's simplicity. I loved and start to make one! Thanks for the idea! This is gorgeous, I love it. WOW! Wish I just lived an hour away from Yellowstone. We've visited 6 or 8 times, lost track, but we live over 1,000 miles away! One of my favorite places. Cute quilt, I might have to make one of those. You are so lucky to be in Eastern Idaho! I grew up 1 hour from Yellowstone! Yeah! I loved it. I loved Playmill back in the day too. And where are these ice cream cones, a friend is going to be in Yellowstone next week. Love this, just beautiful color! Have fun in Yellowstone!